Note: This story was produced for JCOM 2160, Introduction to Online Journalism, which emphasizes hand-coding HTML. 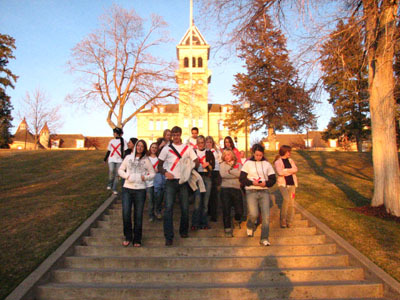 May 6, 2008 | Invisible Children, a non-profit organization started by three college students, visited USU's campus the first week of April. They told the students present at the showing of a new documentary that there have been a lot of positive things happening. The number of children who have to commute to the city each night to sleep so they won't get abducted by the militia has diminished from thousands to hundreds. This was due in large part to awareness that Invisible Children brought to the issue in 2006. That news gave hope to many students involved with the USU club Aggies for Africa. "I'm glad that things are starting to happen," said Coy Whittier, president of Aggies for Africa. "It's news like that that makes me want to work even harder to end the suffering that's happening there because I know we're making a difference." The week after Invisible Children's visit to USU about 40 students walked to raise awareness for those in Uganda who are still displace by the ongoing war. Students met in the hub and made shirts with red X's and the words "night commute 2008" on the back. They walked from Old Main down to main street where they watched a short documentary about a boy named Emmy who lost both his parents to AIDS. After the film they walked back to the Living and Learning Community where they watched Blood Diamond. Many of the students that walked slept on the floor symbolically doing what the children of Uganda do every night to survive. "It was a really cool experience," said Brett Zollinger, a junior majoring in Economics and Political Science. "It's awesome to be a part of a group that really cares about making a difference." To learn more or to get involved you can check out the Aggies for Africa group on Facebook. Or you can go to the new Unganaproject blog.